Can be a bit heavy for some beginners. Not for shooters looking for budget crossbows. 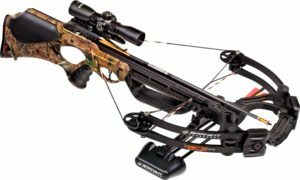 With a weight of just 8.1 pounds, this crossbow by Barnett is little heavy for beginners, but one tends to get used to it after a few days of shooting. You can use the wax given in the package to wax the strings to make it smoother for use. As per Barnett’s recommendation, applying a thin layer of wax every 10 arrows fired should be the standard practice for crossbows. 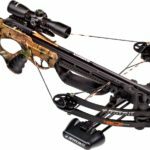 With a draw weight of 175lbs and 356 FPA shooting velocity, The Barnett Buck Commander is clearly a winner among many high-end crossbows for beginners available in the market. For cocking a crossbow with the draw weight requires using rope cocking aid supplied in the package itself. This will reduce the force required to draw the string by 50%. Even though Barnett crossbow lies in the category of mid-price range crossbows, the Buck Commander is far too powerful for home-made targets. With the velocity of 370 FPS, you can easily forget about the target practice from the distance of fewer than 20 yards, as the force is more likely to splinter or shatter your arrows. It is a powerful crossbar and many people will simply love the performance they will be able to deliver with it. The design is exceptionally well made, and even a total beginner can consistently shoot quarter-sized targets from 30 yards and further. Buck Commander simply has no limits. You can take down elk, buffalo, deer, bear, and elephants (if they are legal in your state). The Barnett Commander uses AVI technology that claims to reduce the noise levels of the crossbow by an average of 20-25%. As far as the range is concerned, you can get perfect clean pass-through on any target from even a distance of 60+ yards. This crossbow from Barnett is so fast and quiet that your target would barely manage to move before the arrow hit it. The Barnett Commander is packed with three 22 inch carbon arrows with attachable field points for easy target shooting. These are pretty strong arrows and likely to last a very long time if you maintain it appropriately. Exceptional durability is the right word here. The Buck Commander can survive the drop eve from 10 feet without a scratch. Even the string will be safely latched in position. Barnett has used Barnsdale laminated limbs, which include AVI technology – Anti Vibration Isolation, designed to reduce the noise level by 20-30%. Best crossbow in the market available for less than $800. Accurate and comes with illuminated multi-reticle scope. Capable of hunting animals of any size and weight. Very deadly at ranges of 60 + yards. Very quiet and low maintenance. Comes with rope cocking aid and three high-quality arrows. Barnett has managed to change the definition of compound crossbows. The Barnett Buck Commander is very powerful, offers spectacular shooting precision, and it’ll hunt down any animal in the world. What else would anyone ask for? It is worth each penny spent on and buyers will definitely enjoy every moment playing with it!